We’ve written four books about business management, the latest being The Pocket Small Business Owner’s Guide to Business Plans. 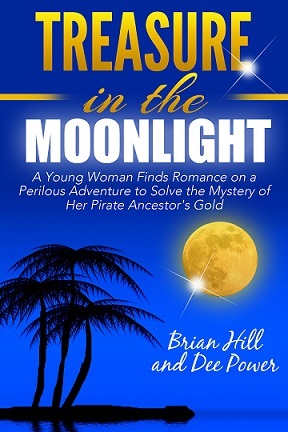 This year our novel Treasure in the Moonlight was released, a suspenseful adventure blending a contemporary treasure hunt with 18th century pirate lore. While researching the novel, we discovered that pirate captains, just like modern-day CEOs, employed time-tested management techniques that made them successful. The buccaneers defined success as capturing more treasure than competitors (maximizing ROI), building a cohesive, well-trained crew (maximizing productivity) and of course avoiding being captured by the Royal Navy and hanged (voted out by the Board of Directors). One of the reason pirate captains are underrated as managers is that they didn’t record their management principles on paper because their lives were often cut short. Captain Edward Teach, aka Blackbeard, for example was reputed to be working on his own business motivational book tentatively titled, “Who Moved My Doubloons?” but tragically before he could finish it he got his head cut off during a battle aboard ship. The captain was elected by the crew and could be removed if they weren’t satisfied with his performance. Every crew member was deemed to have a stake in the success of the voyage. Before the voyage a code of conduct for the enterprise was drawn up during a council made up of the pirates, and each crewmember was bound to obey it. This system encouraged team spirit and loyalty among the crewmembers. Imagine it’s your first day at a corporate job and the CEO asks your opinion of the company’s code of conduct. You’d probably faint. Pirate ship compensation was heavily incentive-based. “No prey, no pay,” the system was called. On one ship, as quoted in the book Under the Black Flag, the formula was: “The captain and quartermaster to receive two shares of a prize; the master, boatswain, and gunner, one share and a half, and other officers one and a quarter.” Each crewmember received a specified share as well. Everyone knew what share they would earn. Since these compensation formulas were not secret, resentment of them by the crew was minimized. No top-secret “salary grades” for the brethren of the coast. When approaching another ship at sea, pirate captains would often fly the flag of a friendly nation rather than their signature pirate flag. The unsuspecting ship would let them approach, and the pirates would attack. We’ve seen this in business when a company seeks a joint venture arrangement but really just wants to pirate your customers or your intellectual property. Savvy captains of the era would not trust these false colors and kept their crew on alert for a possible battle whenever they encountered an unknown vessel. Letters of Marque were licenses issued by Royal Authority, and sometimes by authority of the Colonial governors. These allowed a privately owned ship to hunt down and plunder the ships of enemy nations without any consequences or punishment. These ships were referred to as privateers, not pirates. The Letters of Marque spelled out what these privateers were allowed to do, and what actions were out-of-bounds. Having privateers effectively gave a nation additional global naval power, in other words, expanded their distribution channels. The danger for the official issuing the Letters was that their “independent contractors” would lose their moral compass and attack the wrong ship, which could be interpreted as an act of war by the country that ship was from. This problem often occurred because the official couldn’t possibly supervise an independent contractor that was sailing on the other side of the world. A great thing about the pirate private health insurance program (PPHI) was that it was available from the moment the ship sailed, not just during a vague “open enrollment period.” The pirate captains were careful to keep their promise to the crew. As one captain said, “If ye likes yer plan, ye can keeps yer plan.” Captains who broke that promise might find themselves marooned.